The owner had only purchased the vessel recently and it is believed the engine cut out not long after refuelling. Attempts to restart the engine provided an ignition source that ignited the volatile petrol vapour. All on board suffered minor burns. Petrol vapour is heavier than air and it will settle in the lowest areas of a boat, usually the bilges and will explode violently when ignited. Over the past 10 years there have been more than 100 boat fires and explosions, some of which resulted in very serious injuries, with more than 90 per cent occurring on vessels fitted with inboard petrol engines. We strongly urge boaters to only use properly marinised engines, have them regularly serviced by a qualified marine mechanic, and utilise vapour detectors and bilge blowers that can help to prevent incidents such as this occurring. Keep spare fuel in a tightly capped, secure container. 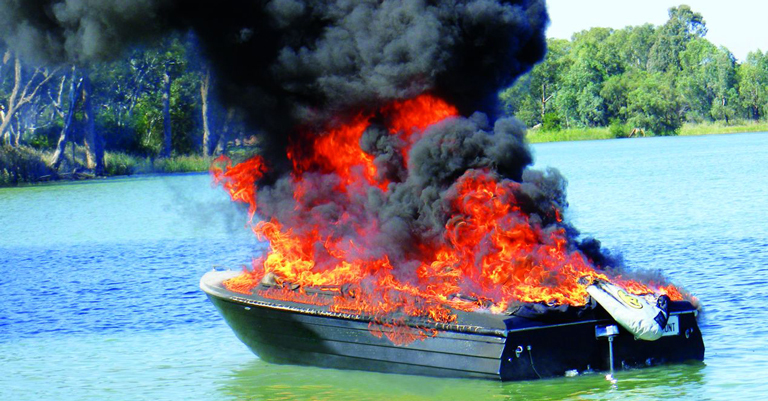 Why do boat fires happen? Ski boats with inboard petrol powered engines are most vulnerable to fire risk. Older vessels in which electrical and automotive components have aged and become worn are also commonly involved in fire related incidents. Follow these tips in addition to the refuelling rules. Make sure you have the right size and number of fire extinguishers on board, and keep any built-in automatic extinguishing systems serviced. Read more about maintenance and fire prevention.